Today, physicists across the world celebrated as telescopes and observatories on Earth and in space captured a “kilonova.” Two neutron stars collided 130 million light years away, sending gravitational waves, x-rays, gamma-rays, radio waves, and light waves to the Earth. But these events also serve as a new kind of tool—a tool with the potential to answer one of the most fundamental questions in our universe: How quickly is it expanding? The further out we look, the faster galaxies seem to be traveling away from us. This property comes with a number imprinted on the fabric of the universe: the Hubble constant. But the problem (as we spoke about earlier this year) is that the Hubble constant differs depending on how we measure it. Scientists can use these neutron star mergers as “standard sirens” and maybe one day confirm the true value of the number. One way scientists measure the Hubble constant is by peering at the most distant light they can see: light from just a few hundred thousand years after the Big Bang, which scientists call the Cosmic Microwave Background. The European Space Agency’s Planck Satellite used this light to measure the constant at around 68 km/(s*Mpc), meaning that for every additional megaparsec into the distance it looks, or three million light years, light sources move 68 km/s faster. But other experiments requiring a combination of lots of galaxy observations imply that the value is 73 km/(s*Mpc). Both measurements are precise enough that either one of them is broken, or the universe is much weirder than scientists previously thought. Both measurements have their downsides—the first requires strong assumptions and the second introduces many potential sources for error, explained Anže Slosar, a scientist who studies this problem extensively with his group at Brookhaven National Lab. But scientists can use the new neutron star merger results to measure the value of the Hubble constant directly without a sort of ladder of different observations. They pulled data on the distance to the neutron stars based on the “GW170817" gravitational wave event, and determined the velocity of the host galaxy, called NGC 4993, by analyzing the light. The value they reported was 70 km/(s*Mpc)... plus or minus ten, according to the research published today in Nature. That means the error bars were so large that the researchers couldn’t determine which value, 68 or 73, was more accurate. That’s okay, though. Scientists are currently upgrading the gravitational wave detectors, including both LIGO machines as well as Virgo. 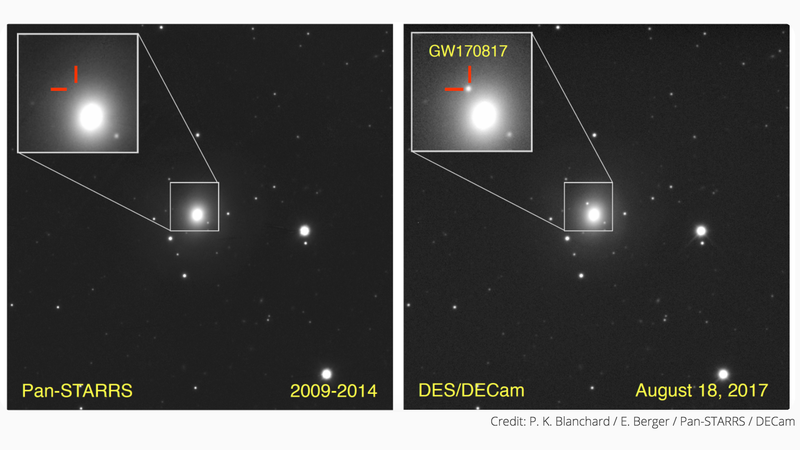 But when all of the machines turn back on next year, researchers expect to see as many as one neutron star merger per month, as we reported today. This will refine the measurement.